All transactions are safe and secure with a reliable history in online purchasing behind each of our associates. Buy the Hannah Montana Pajamas to own Hannah Montana clothing and merchandise. 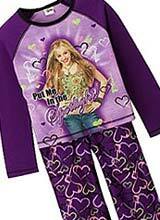 The purple Hannah Montana pajama set shown on the left includes a sleep shirt and sleep pants. The pants feature a drawstring closure and a full elastic waistband. The long sleeve Hannah Montana t-shirt top displays a real Hannah Montana photo, with the phrase, "Put Me in the Spotlight," printed overtop. Hearts and guitars decorate the background of the design, which is similar to the purple and pink pattern of hearts and guitars that covers the pants. This bestselling Hannah Montana clothes combination is available in four different sizes. In addition to the Hannah Montana Pajamas above, browse the Hannah Montana Clothing Gallery for more apparel like men's and women's clothes, kids shirts or hoodies.